Edward Peters is a well-known canon lawyer, an expert on the law of the Catholic Church. Dr. Peters has been much in the press lately. He provided expert canonical knowledge about what happens when a living Pope resigns, what Church law requires for the valid election of a new Roman Pontiff, as well as canonical commentary on actions of the new Holy Father, Pope Francis — especially regarding the Pope’s decision to include two young women in the foot-washing rite of Holy Thursday. His most recent blog post provides commentary on the letter by Fr. 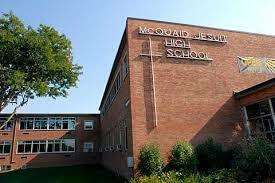 Edward Salmon, S.J,, president of McQuaid Jesuit High School (Rochester, NY). Not surprisingly, Dr. Peters finds great fault with Fr. Salmon’s decision to permit two male students to attend that school’s Junior Ball as a couple. Also not surprisingly, I disagree with Dr. Peter’s in his assessment of Fr. Salmon’s very pastoral decision and his clear articulation of the reasons for it. Thankfully, God’s People understand more and more that “the Church” is not limited to those with leadership roles, but rather includes all — as we celebrated once again this past weekend — who have been baptized into the saving life, death, and resurrection of Jesus Christ. Through our baptism and our faith, there is also wisdom in the People of God and in our lived experience. It is this lived experience, I believe, that is behind the process that is forming the consciences of so many Catholics — now even a majority of Catholics — who see the full humanity of their/our LGBT brothers and sisters; and who likewise see the limitations of formal teachings that have called that full humanity into question. In addition to “what the Church wants her members to know,” it’s also vital to the life of the whole Church that those in positions of leadership listen to “what her members” want them to know! This entry was posted in Commentaries and tagged ecclesiology, Edward Peters, McQuaid Jesuit High School. Bookmark the permalink. Thanks … I’ll check it out. in the near future but I’m having a hard time deciding between BlogEngine/Wordpress/B2evolution and Drupal. The reason I ask is because your design seems different then most blogs and I’m looking for something completely unique. I use WordPress. It’s very intuitive and user-friendly.